Heavy, heavy, heavyweight Boogie here from the legendary Salsoul catalogue! The man - Leroy Burgess - with his frequent collaborator 'Red' Greg Carmichael turned in this insane 2 sider in 1981 ('Dancing into the stars' on the b-side! 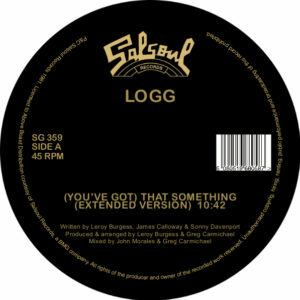 ), both cuts just ooze that synthed out disco soul that Burgess is known for, super deep and with flawless production. Extended jams on both sides, tracks that go on and on in the best possible way! Simply put, this one's is an ESSENTIAL! Leroy's influence on House and Garage music should not be understated and it's records like this one that prove this over and over again! Record's like this still get spin in the clubs, they still have people losing it on the dance-floor! Timeless dance music from one of the most legendary artists and labels in the game. This record is all about having fun, partying & losing yourself in the music, an essential classic that has stood the test of time for the last 30+ years & is now available again, legitimately remastered & repressed for 2017 in conjunction with Salsoul Records, NYC. You NEED this one!